This picture of Venus, taken by the Venera 13 space probe, corresponds to astronomer’s typical descriptions of the planet- that it is a lifeless desert. Does such a description invalidate the Puranic descriptions of life on other planets, including the ones along “ Bhu Mandala,” the plane of the planetary orbits, our solar system? Maybe the question really is, can we trust this picture? The Venera 9 lander, for example, passed through an upper atmosphere in which clouds swirl around at 360 kilometers per hour—the lander reported a surface temperature of 900* F. We are assured that the lander carried an ample cooling system for its mission, but we all may want to ask what material the parachute was made of! It opened up at 60 kilometers above the surface of the planet. Even assuming that the craft was able to parachute through the 360 kilometer per hour winds found in the Venusian stratosphere, the question remains: What could that parachute have been made of that it did not melt nor burn during a 60 kilometer descent at 900* F? NASA ( Never A Straight Answer ) seems to have met its match in the Russian space agency. The Bhagavat Purana paints a different description of the planet. In the ninth canto, 18th chapter, a narration describes the activities of Devayani, the daughter of Shukra- the predominating regent of the planet Venus. There, a palace garden is described full of lotuses, and trees of flowers and fruits, inhabited by sweetly singing birds and bumble bees. It is described that lotus-eyed girls took a walk along the bank of a reservoir. At one point in the narration, Shukra-Acharya, Devayani’s father, made a comment about grains in the field. According to this description, Venus seems to harbor life as on Earth. In fact, according to the Puranic descriptions, there is life and activity on all the planets. For example, in the Bhagavat Purana, Canto 4, Chapter 20, Text 35 - 36, a reference is made to the way in which Maharaj Prithu, a king of the Earth, paid his respects to visitors from various celestial planets, and then a reference is made to the inhabitants of the earthly planets. Now first of all, the reader will note that the text refers to earthly planets, in the plural. In the Vedic literature, one term used to refer to the Earth is Bhu Mandala, which means the " circle of the Sun, " which seems to refer to the planets along the plane of the solar system, as pointed out by Dr. Richard L. Thompson in his book “Mysteries of the Sacred Universe.” This is why the plural is used, the planets in the solar system are somehow grouped together in this sense because they are all on the same orbital plane. It is interesting, though, that we don’t apparently see inhabitants on any of the other planets in the solar system. In fact, the Apollo astronauts have supposedly gone to the Moon and found no life there. Through their telescopes and space probes, astronomers tell us that there is no life on the other planets such as Mercury, Venus and Mars, either. It is important for followers of the Puranic version to understand these statements so that their faith in the entire Vedic presentation may not be shaken. We can consider the difference of opinion between these Puranic statements and modern scientific allegations, that the planets are uninhabited and lifeless, by considering whether the Apollo astronauts really went to the Moon, whether or not there might actually be artificial artifacts on the surface of the Moon, and whether or not the key to understanding the nature of the Puranic statements might not lie in the fact that the planets are hollow. Recently, there has been quite a bit of private investigation into the validity of NASA space probe and Apollo photographs. Much of the results appear on the internet. Apollo debunkers point out various photographic anomalies which challenge NASA claims. For example, there is a famous picture of the rocket motor on the Lunar Excursion Module, which was supposedly turned off two meters above the surface of the Moon. The anomaly has to do with the fact that the picture shows no disturbance on the soil underneath it. There is also a famous photograph, taken from an ELEVATED angle, of the astronauts on the Moon with their hands free and the LEM in the field of the picture, but nobody there to take the picture. There are divergent shadows on fairly level terrain, although only one light source exists on the Moon, the Sun. Glare is seen in the Apollo pictures, even though glare is caused by the atmosphere and the Moon supposedly has none, and the NASA sign -specifically the sign on the side of the LEM away from the Sun- is illuminated in various film clips, indicating spot lights or such. There is more- but for reasons such as these, we may take a dim view about NASA claims of lifelessness on the Moon and withold any judgement again the Vedic statements. Perhaps the key to understanding the difference between the Puranic version and the version of modern astronomers lies in the following statement which Bhaktivedanta Swami made in the summary study of the Bhakti Rasamrita Sindhu. On page 11, he writes of how the yogi " ... can enter into the sun planet simply by using the rays of the sunshine." How unusual that he writes about living entities “ in “ the planets. In the English language, it is very unusual to refer to a population living “ in “ the planets. We always say “ on.” And we have already pointed out that in the purport to the 4th Canto, Chapter 22, Verse 54, he writes that “ the Moon is full of highly elevated inhabitants who are counted amongst the demigods.” A planet “ full of “ inhabitants does not suggest life on the surface of that planet, but rather within. Could it be that the principal population of a planet lies in the planet’s interior, and that, for example, the parks, lakes and lush vegetation described in the Puranas in relation to the Moon, Venus and the other planets exist inside of the them, along with the inhabitants? Such an understanding would completely vindicate those puranic statements which seem so fantastic that they are unintelligible to us currently, and establish new-found validity for the puranic astronomical scheme of things. Does any support exist of such Puranic descriptions? The following NASA photograph of Venus, number: 79-HC-46, seems to do so insofar as it supports the Hollow Planets Theory. If Venus were hollow then perhaps in this way the Vedic civilization could exist- not " on " Venus, but within. Note: This picture was culled out of NASA files by Jan Lamprecht and appears in his book “ Hollow Planets.” Both the picture as well as the arguments in relation to it have been adapted from Mr. Lamprecht's book Hollow Planets. We can start with evidence of polar openings. Astronomers tell us that the atmospheric level above the Venusian North Pole is 15 kilometers lower than the rest of the planet. Is this depression indicative of atmosphere being sucked into Venus, just as the cloud billows superimposed on the southern pole indicate a huge, spiraling outdraft? Does ventilation occur through the Venusian poles? The reader will notice how the curvature of the planet’s atmosphere changes as his/her eye approaches the Southern pole. Several, rounded, twirling, cloud billows are obvious, and there seem to be several folds. They rise out of the Southern extremity and elongate the atmosphere. Venus does, in fact, experience a rising and falling of its atmosphere by as much as 1.1%. That represents a huge expansion given the fact that the diameter of the Venusian globe is supposed to be 7,700 miles. Could the expansion of the Venusian atmosphere and the billowing at the poles be a symptom of the planet’s breathing through polar holes?
" 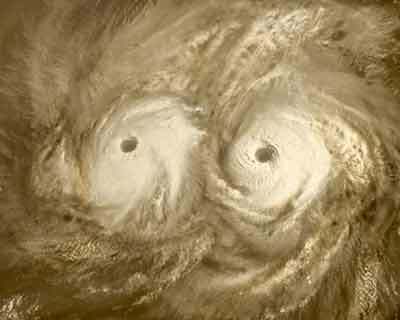 Radar pictures recently taken of Venus show two almost perfectly round depressions that are antipodes of each other. One has a diameter that is 40 percent as great as that of the planet itself. The other has a diameter nearly 30 percent as great. Incredibly, these were explained away as being impact craters. It is difficult to believe that even the scientific community has any members of sufficient mental vacuity to endorse such an explanation. Yet the author knows an honored member intimately who insists this is what they are. As anyone who has even a modicum of intelligence should realize, an impact crater will have a depth that is a reasonable percentage of its diameter, especially if the missile does not bounce off and sinks below the surface. An impact capable of producing a crater with such a diameter would completely shatter even a solid planet. The impossible coincidence that a planet would have two such craters nearly the exact antipodes of each other has been cheerfully ignored. The only possible explanation is that these " depressions " are giant openings into the hollow interior. The energies being radiated from these openings would deflect radar to the extent of creating the illusion of their being shallow sinks. Venus, being closer to the sun and in full view of the binary, would require much larger openings to dissipate the heat that would build up in the interior. And in fact, as can be seen by this European Space Agency image below, culled by Luiz Aparicio of Portugal, the Venusian opening seeems to be binary, which would certainly help to dissipate the energies that build up within the planet. Do the warmth and brightness of the Venusian poles tell a tale of polar openings? (Lipstick on your collar, ( polar collar ) tells a tale on you!) The infrared radiometer on the Pioneer Venus Orbiter discovered an elongated emanation from the northern pole, 4,000 miles across, stretching down as far as 70* latitude on each side of the planet. According to Schubert, it is a temperature feature, and it is bright. The atmospheric depression falls within this feature. What could cause these phenomena at the Venusian poles? Air currents to the interior as well as interior illumination answer the question well. But the strangest sighting of Venus ever made was that by the very famous and respected German astronomer, Maedler in the 1800's. He once observed Venus as looking like a comet! His drawing of Venus showed two beams of light emanating from both its polar regions. These beams of light were pointed towards the Sun, and gave Venus the appearance of a comet with two tails! At the time Maedler conducted several tests by changing eye-pieces, and moving his telescope to ensure that what he was seeing was real. It remains to this day the strangest sighting ever made of this planet. So there is a varied base of evidence which reinforces the theory of polar openings on Venus. Furthermore, not only does Venusian phenomena help to establish the Hollow Planets Theory, but the hollow planets theory helps to explain Venusian phenomena. For example, the long standing enigma of the Y marking on Venus can now be explained. The powerful torrents in the NASA picture end up being deflected in the direction in which the planet is rotating, caught up in a Coriolis effect. This can be seen in the picture in the form of a dark streak ( ultraviolet ) which originates in the South Polar cloud twirls, in the NASA picture, and then streaks around the planet and lines itself around the equator. It is joined by a similar dark streak from the Northern hemisphere of the planet. If hollow Earth advocates, who are not professional astronomers, can arrive at such conclusions from the little bit of data which makes it through NASA censorship, then how much more must NASA really know? 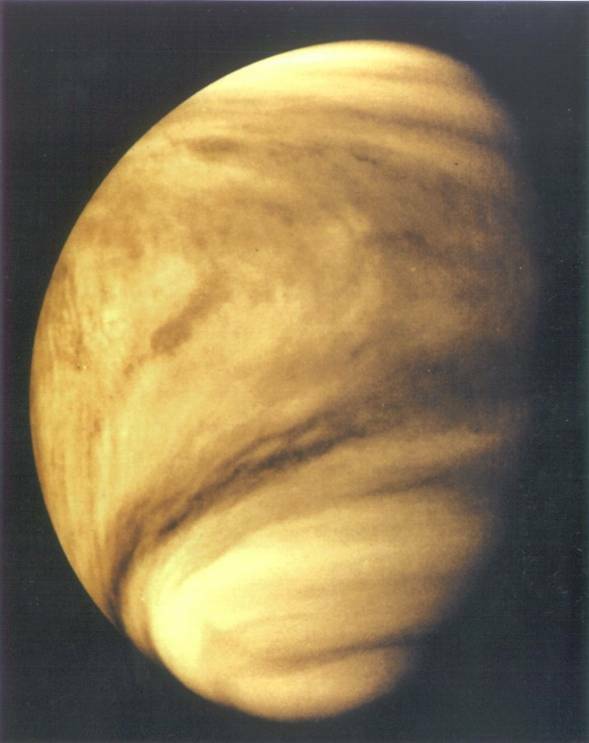 Why is it that Venus has been entirely mapped by radar except for the poles? Even commercial globes of Venus, made available in catalogues and stores, simply show flatness at the polar regions. These regions are places where inordinate illumination is observed, where the cloud level dips, where huge depressions have been observed with high rims around them, areas across which the gibbous horns from the illuminated side of Venus project themselves in an exaggerated manner, which are the sink hole of vortices and which are the origin of wind patterns that cover the Venusian globe. Maybe the Russian space agency hasn’t bested Never A Straight Answer ( NASA ) after all, though it might be a close tie. The conclusions are obvious. Though readers of Vedic literature do have special reasons to accept that civilized life on Venus exists in the light of the Puranic descriptions, certainly no one should deny the possibility of an advanced, human civilization on or inside of Venus until the interior of the planet is peered into through the polar openings, and not by means of NASA probes or any Russian space agency.